IMCO Vote Delayed – Again! You are here: Home / EU - Regulating Biking / IMCO Vote Delayed – Again! The vote scheduled for the 22nd November 2011 in the IMCO (Internal Market and Consumer Protection Committee) regarding the Approval and market surveillance of two – or three-wheel vehicles and quadricycles for want of a shorter and non Euro speak – Anti-Tampering – has been delayed for a second time and rescheduled for the 5th December 2011. The vote was due on the submitted raft of amendments, around 305 of them, by MEPs to the original European Commission proposal. We reported recently that the MCWG – Motor Cycle Working Group (a working group set up by the Commission) had met again on Friday 16th of September to discuss the issues surrounding the Commission’s proposals. The Commission informed the MCWG meeting that the timetable for implementing the proposed regulations had been changed. As the Rapporteurs (MEPs in the IMCO Committee headed by Dutch MEP – Wim van de Camp) in charge of the IMCO amendments were sorting out these for the final vote, we were told that there was a desire to get to the bottom of the issues and to better align with the progress in the Council of Ministers and the introduction dates. So is the delay to get it “right” or is the EU proposal in a mess? One of the aims of the proposal is to simplify the current legislative set of 15 Directives by replacing them with just 5 Regulations which are technical regulations based on harmonised international standards adopted by the UNECE (United Nations Economic Commission for Europe). A small number of delegated acts will be created containing technical measures not covered by UNECE Regulations. We have had major concerns due to where the proposal sits at present within the legislative process. It is our understanding that the proposal was scheduled to be voted on before the regulations, delegated acts and the adoption of harmonised international standards, had been agreed on. In our opinion, all these issues need to be formulated before any agreement or alignment within the Council of Ministers and before any vote within the EU parliament takes place regarding the Commission’s proposal and subsequent amendments put forward by the IMCO committee. Failure to do so would create an impossible situation whereby the motorcycle industry, consumers and member state governments are not able to have a clear understanding of what the simplification of this regulation actually entails. This seems to be a common sense approach as it is absurd that a proposal for a regulation should be agreed upon without a clear understanding of the outcome. The UK Government is seeking the inclusion of an obligation on the Commission to fully evaluate the impact on industry and consumers for any future technical measures (under delegated acts) on new functional safety items and following adequate scrutiny processes. However the Regulation is due to enter into force from January 2013 with the process of drafting and adopting the implementing measures and delegated acts, the UK Government has stated that it is likely to leave insufficient time for the Government or industry to be ready. This latest delay requested by the rapporteur Wim van de Camp suggests that he and his team still have a lot more work to do to present a half decent report. Our suspicion is that the problems are not – this time – the devil in the detail, but the overall aspects of the proposal – the argy-bargy between the Commission and Parliament over who has control of legislation; the political differences between the various groupings in the European Parliament; but most of all, what has become evident is, with perhaps one exception (the Chairman of the IMCO who is an automotive engineer), the other shadow rapporteurs have demonstrated their inability to grasp the complex technical issues surrounding motorcycles and other L category vehicles. Regulation Yes! 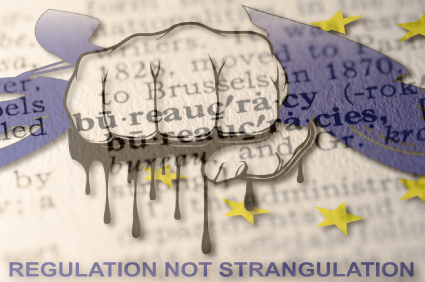 – Strangulation No!